A Winning Weekend for Wales and Cardiff Rivers Group! 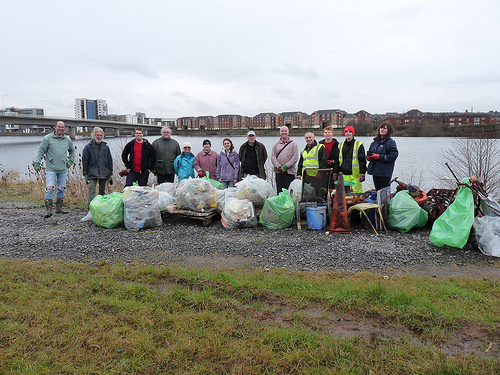 On the day that Wales beat France in the 6 Nations, ended their losing streak, Cardiff Rivers Group won their own battle against litter in Cardiff Bay. Following the recent storms, high river levels and a breach in defences, the amount of garbage festooned over the banks of Cardiff Bay was astronomical! Earlier in the week, the award-nominated volunteers were approached by the Port Authority to help tackle the river bank alongside Hamadryad Park that had become a real eyesore due to the amount of floating debris that had washed up. 16 intrepid volunteers worked hard for over 3 hours and collected a staggering 69 bags of rubbish, as well as 2 fire extinguishers, a bag full of footballs, 10 bread crates, a sand pit, 6 car wheels and even a kitchen sink! More photos can be seen here..
All rubbish was disposed of by Cardiff County Council’s Parks Services. This litter pick shows that with determination and hard work by only a few volunteers, areas can be transformed. During the event, a large numbers of passers-by stopped to chat and thanked the group for their hard work. Cardiff Rivers Group formed in 2009 as part of the ‘Tidy Towns’ project: a partnership between Keep Wales Tidy and Welsh local authorities. Funded by the Welsh Government it supports the people of Wales to improve the quality of their local environment. The group has recently been shortlisted for the river improvement category of the Tidy Wales Awards and will be attending the awards ceremony on 27thFebruary to meet Environment Minister, John Griffiths.